"Black Dawn" - Part 6: "Fade to Black"
Superboy is the unwitting pawn of Manchester Black but now Superman has his allies to assist him. The battle is a mix of fists and emotion, but with Cobb Branden dead Kathy helps tip the balance in Superman's favor. The fight between father and son is violent as Black taps into Jon's hidden potential and the villain's manipulations have literally poisoned the young boy's mind, until a surprise visitor reaches out to Jon and brings him out of it. Story - 5: It is a difficult book to review as there is minimal story, but despite that it is not without content. A nice bookend to the first 25 issues, not as strong as Wonder Woman's but it has had some fantastic stories that, now, looking back really do add a new layer to Clark's relationship with Lois and Jon. 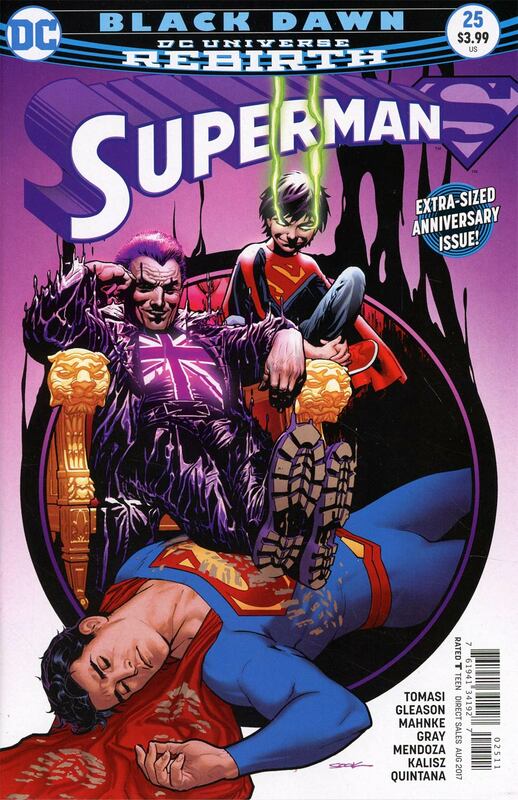 Manchester Black is almost secondary to the story, his manipulations bring out what is buried deep within both father and son. It seems to be resolved by the end of the story but I can't believe that darkness will stay hidden forever. The comment that Hamilton County is Jon's Smallville reinforces the direction and there is a scene between Jon and Kathy that echoes Lana and Clark. Gleason & Tomasi have written a brilliant arc with cohesion that runs through all 25 issues. A predictable end but extremely well told and there is an absolutely brilliant end to the story that I refuse to spoil because it is a wonderful example of karma that I guarantee will make you smile. 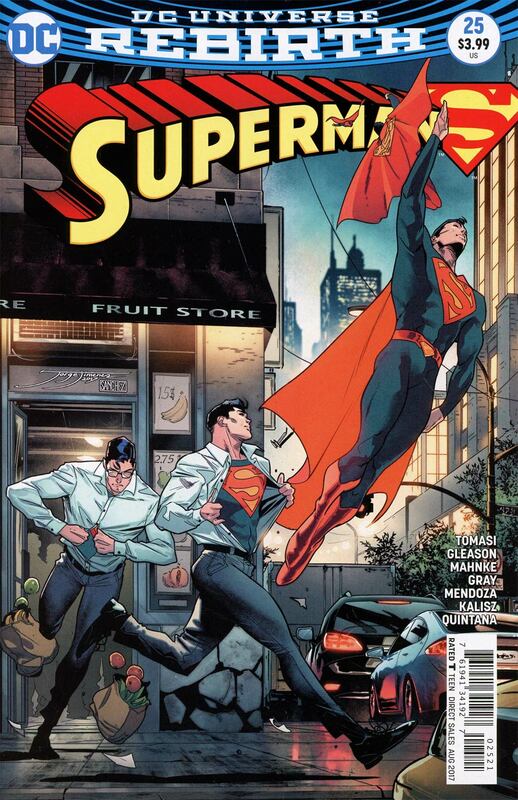 Art - 4: Remember that cover to Superman Rebirth #1? Flip through the book until you find the page with Jon as a dark reflection of his father. The book is visually spectacular, faultless (until they change artists) but for the bulk of the book it has some incredible layouts with some skill to the intricate details. Cover Art - 5: It makes the blood run cold, this image, with a child, corrupted and his abuser making him hurt the ones he loves. The ending is all the more impressive viewing the tumultuous spectrum of emotion this cover evokes. Those boot prints just make me want to try slugging Manchester myself. Variant Cover Art - 5: How fantastic and iconic is this cover? There is some much to love in this Jose Garcia Lopez homage. I would love this as a print.